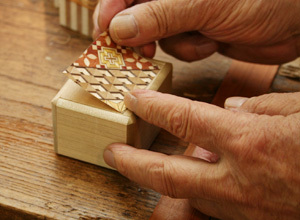 Making Marquetry - Hakone Maruyama Inc.
Each of different-colored wood pieces are planed to the proper thickness to make Yosegi pattern and fastened with glue in order of the pattern. 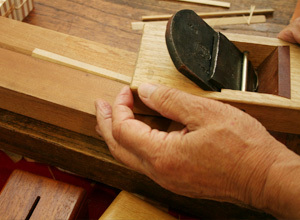 The layered wood are sawn to fit a Yosegi-specific mold into a piece. 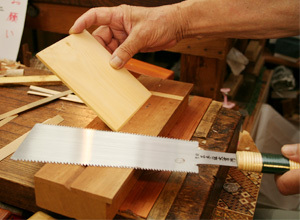 The cut pieces are planed accurately. 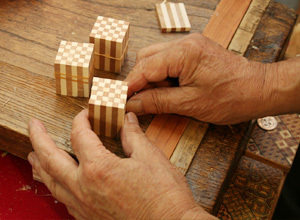 The glue is spread out on each completed piece to make a unit pattern. The pieces are tied together and glued. 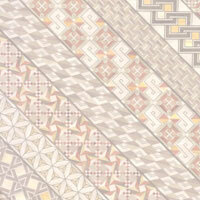 Then this block of a unit pattern is sawn into several slices to form a larger pattern. 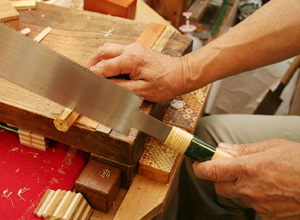 The cut slices are glued together again. 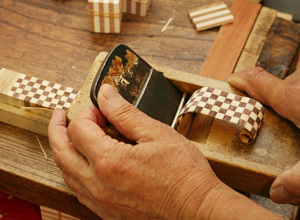 This repeated process of cutting and gluing makes a larger pattern. The resultant plate is called Tanegi. The plate is shaved carefully into thin sheets with a special big plane. This shaved sheet is called Duku. As the shaved sheets are shrunken, they are ironed and stuck on the products.